On this day 5 years ago my Uncle Adi passed away. He is very much missed. 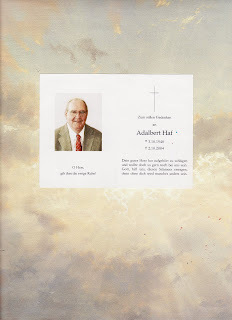 Adalbert Haf was an identical twin to Helmut Haf, my maternal German uncles. What is even more amazing is that both their deaths were identical too. Each being diagnosed with the same disease in the same part of the body during routine physicals ten years apart from each other. Tomorrow Oct 3rd is their birthday and I will be honoring them on their day. I´m very happy about this posting. It´s good to see, that my dad is not forgotten. He is in so much hearts every day. Your father my very dear Uncle Adi will never be forgotten, he is so very much missed and very much loved. Love you too my dear German cousin Marion.